…With a footnote that students need preparation in communication, economics, ethics and policy! The Rule of 3’s (or 4’s) – where students need to be introduced to a topic three or four times in their undergraduate studies before it sticks with them. Critical issues for students to become employed (in geoscience, but certainly can be applied to a range of STEM disciplines) = (1) strong communication skills (like listening, interpreting documents); (2) internship experiences are HUGE. And there were many other discussions that had us thinking that maybe we need to get away from worrying about what “content” students need to know when they graduate, versus competencies/skill sets critical to their future successes (and “success” may not be a job in the geoscience field). My working group spent alot of time thinking about introductory geoscience courses, and how we as instructors really need to carefully construct those courses for non-science majors – again, looking at what we want future citizens to know (their “science literacy”) that are working in non-science fields. But I also had another cultural “wow” moment today, just like my tour of the Texas State Capitol (see yesterday’s post) where I saw the spot State Senator Wendy Davis took her stand. I remember learning years ago about a shooting at a university in Texas that was one of the most tragic shootings on a college campus. I recalled that the shooter was positioned high up in a tower. 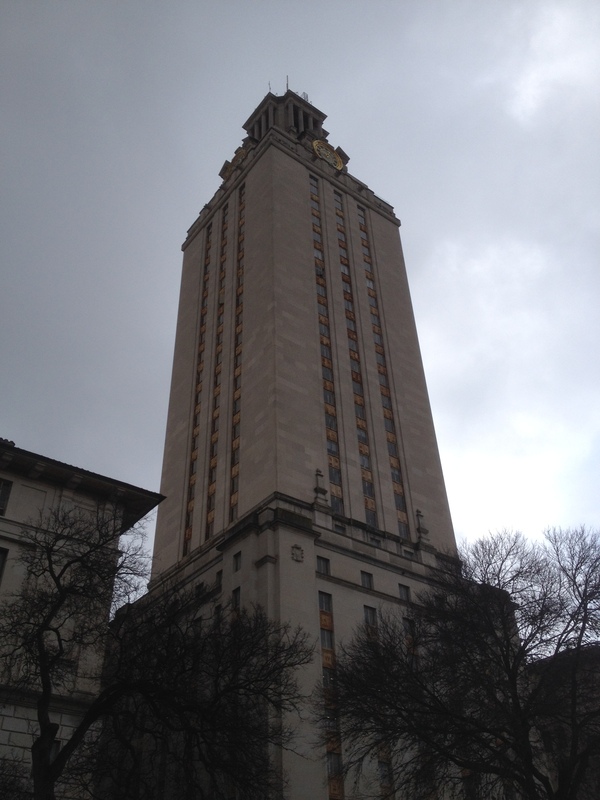 For some reason, when the bus drove to campus this morning and I saw this very tall tower on campus I started thinking to myself – is this the spot? I did a quick internet search that confirmed for me that this was the university, and the tower I was looking at was “the” tower. 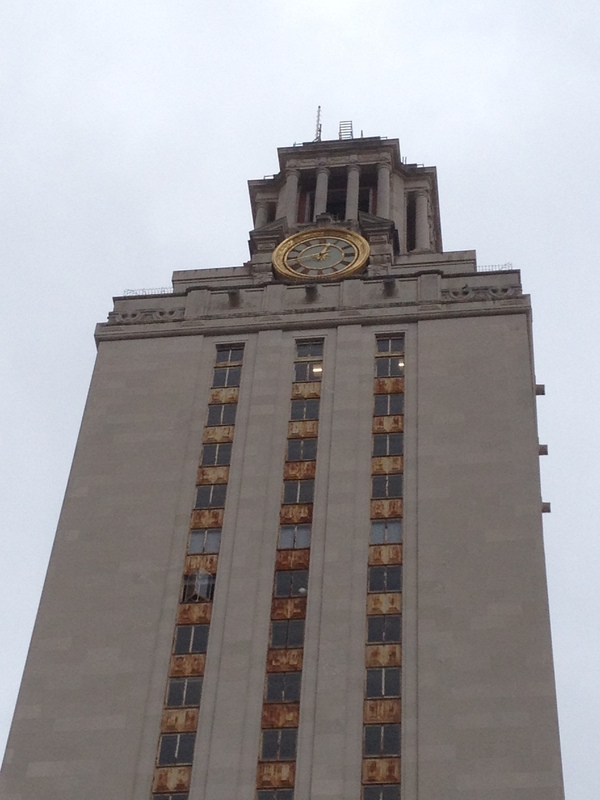 During the lunch break, I walked over to the tower, part of the Main Building on campus (yes, their campus has a “Main Building” as well). It was just hard to imagine the fear and terror that was felt for 96 minutes when the shooter fired shots at people below, injuring 43 people and killing 13. The shooting took place back in 1966 – before I was born, and is probably an event many (if not all) of my students have never heard about. But I knew I wanted to visit the spot, I wanted to stop and reflect. To learn more about the story, this website has a detailed summary of the event, and there is some historic video coverage available online. I am fortunate that, at times when I travel for work, I also get a chance to take advantage of learning a bit more about local culture and history. You might say that I’m being “multidisciplinary” in my travels to Austin! But time to get some rest and refocus for tomorrow, when we discuss pedagogy (that’s the teaching approaches instructors use in the classroom and online).